Tower of the Stargazer is an introductory adventure written by James the LOTFP guy; chances are you've heard of him long before discovering my little corner of the internet. If not, his site is over here (Lamentations of the Flame Princess), and you can get the module over at RPG Now, Indie Press Revolution, places like that. I've been running a number of OSR modules in my Gothic Greyhawk campaign, so it'll give me the chance to write reviews that include actual playtesting experience instead of hypothetical musings. Note: Because this review will include some play notes, it will have spoilers at the end. Tower of the Stargazer is meant to be introductory - a starting point for new players and new Dungeon Masters. Sure, it has a few sidebars explaining staging and providing advice, But after a quick read, I saw that it would be an excellent way to kick off a new campaign for experienced players, too. Unlike some other introductory adventures, this one has situations that will challenge long time gamers and keep the DM entertained while refereeing. The DM has to love what he/she is doing, right? It's short - 16 pages, good enough for 2-3 nights of adventure. The contents describe the eponymous location, a site-based adventure. Once the party gets inside, there is quite a bit of freedom to wander and explore up, down, or horizontally; it's unlikely two different groups of players would handle the tower the same way. The tower itself is one of the main characters; it's creepy, weird, and interesting. 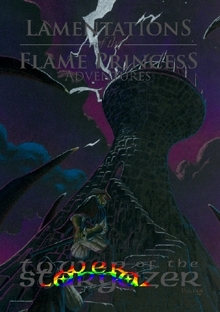 In fact, the tower's story emerges as the players explore it and piece together the history. So why would I recommend this product? First off, a well-designed site based adventure is a hallmark of old school gaming. Player's drive the action through exploration, and the story emerges through play. The DM isn't forcing a story onto the players, there are no NPC's leading them from scene to scene, or turning the game into improv theater. Bring extra characters, because there are deadly traps and tricks; play skill is rewarded here. Game balance is out of the window; there are things in the adventure that will slaughter a first level party if a mistake is made. If you want to hold aloft a sample adventure of what makes old school gaming awesome, this would be my pick. High praise. Oh - and one other thing. It's most definitely a horror adventure. Horror goes with fantasy gaming like chocolate and peanut butter, and if you haven't noticed, I like it that way. I'm constantly inflicting horror on my players. They don't seem to mind. This adventure is excellent; on my personal Beedometer, I give it a 5/5 stars. Okay, so how did it work in actual play? The animated attacking entrails down in the dissection room were a bit lowbrow gross-out humor, but they had excellent surprise value and kept the players on their toes; they almost killed one of the thieves. The set-piece encounter, meeting Calcidius, was an event that continues to affect the campaign to this day; it generated at least an hour of player discussion - it brought in strategy, ethics, problem solving, pragmatism - it transcended the typical game experience. The players eventually went on to "claim" the Tower of the Stargazer as a home base, and they walled Calcidius up, Cask-of-Amontillado-style. They went to town, they bought the bricks and the mortar, and they walled him up. Now that's cold. You can check out the campaign journal with the play reports here - Tower of the Stargazer session 1 and Tower of the Stargazer session 2. Damn this sounds like my cup of tea. May have to use this one to run my group through. Thanks for the playtest reviews. I haven't had a chance to look through this one yet (it is burried in the pile) but I do mean to get to it. Raggi has a nice atomspheric style that I really enjoy, I just haven't yet had a chance to see ho it plays out though. Because his stuff is low on monsters, big on atmosphere, tension builds during exploration... the monsters stand out more. We've played Grinding Gear and are starting Death Frost Doom, so I'll be doing some more LOTFP reviews over time.